Although it might send a contradicting message or two to the regular consumer, Apple has just made its first ever battery case for its newest iPhone official. Cupertino's Smart Battery case flaunts a 99-dollar price tag and is only available for the 4.7-inch iPhone 6 and iPhone 6s at the moment; there is no 6s Plus version, but we suspect that Apple will right that wrong sooner or later. The Smart Battery case that Apple just unleashed on its online store comes with a 1,877mAh embedded battery inside, which provides up to 25 hours of additional talk time to the device, 18 hours of web browsing on LTE, or up to 20 hours of video playback. Knowing the iPhone 6s' battery capacity of 1,715mAh, we can guesstimate that it will most likely double the battery life of the iOS flagship. Speaking of remaining battery life, your iPhone will display the remaining charge in the case both on your lock screen and in the Today section of your Notification Center, which is an unique feature of Apple's case. There is also an LED indicator that shows whether the case is charged or not, though Apple has put it inside the case, which is quite strange and not user-friendly at all. Apple says the accessory supports a wide range of Lightning accessories, most importantly the regular charging cable that you got with your iPhone 6s, which is another unique feature of this case. Apple has also thrown in support for the separately-sold iPhone Lightning Dock, which is quite nice. It's not cheap seeing as they sold their iFans half the phone and will now try to sell them the other half. So hilarious to watch this all unfold. They buy a thin and light phone with a small battery for $650+. 3 months later they get an ugly, fat case for another $100. Now they can have a decent iPhone experience for just $750+tax with only ~9 GB of storage. Well considering you get a 6,55Wh cell + the phone for 650$, then paying another 100$ for ~7Wh cell + smart power mangment + drop protection + added antenas + easy putting on/off + lightning compatible + super quick charging, could be quite appealing to many people. So with this pack, and iPhone will last 2 days before it needs to be charged, yet my Note 5 lasts 2 days on a single charge and when it doesn't which is very rare, quick charge will still be faster than charging BOTH of these. Doesn't it still take nearly 4 hours for the iPhone to charge from completely empty to full? How long is the case goign to take to charge? Same? If the iPhone had great battery-life it wouldn't need this. Yes there are battery-packs with other OEM's too. Samsung has packs too for people who are more aggressive users. I am not talking about them. I am talking about everyday people. When I take my phone off the charger at 730, when I get home at 6PM, I still have 50-60% left for another day of usage. So usually I just dont charge it at night and I take it to work and charge it. even then its enough to last me until early afternoon before it starts to beep. Once I didnt put it on the charger and when I got home it still had 10% left and I dont use any of the power saving modes. Right now, I can get 30 hours of usage with 90% battery and Ultra Power Saving model. I can get an extra 14 hours is I use Power Saving mode. Considering the note is pushing 8 cores, 4GB of RAM, 1440p, TouchWiz, SPen hardware and more shows Samsung is the king of efficiency. Considering according to PA battery tests that the iPhone 6S Plus only matched the Note 5, shows the iPhone is not as efficient seeing as its pushing 2 cores, 2GB of RAM, 1080p, no full multi-tasking, no pen no nothing. Keep on being the fool you are with your always as "salty" sheep self. First of all this is only for the 6/6s. These are smaller phones than the Note line my friend. The iPhone 6s Plus actually has equal or better battery life than the Note line. Secondly, it does not take 4 hours to charge an iPhone. It charges even faster with a iPad charger. Dude, the Note 5 doesn't last 2 full days on a charge, it can get into the 2nd day, but be very low (in the 5-10% range). Who wants that? It depends on usage. My Nite 5 last 2 full days on a single charge. But I probably don't use it like you do. It's my everyday phone but I don't use it for calls. Even though I have games I rarely play them. I use my Note mostly to buy things online, I do see drawing here and their and I read. I keep brightness at 40-50%. I just told you, after taking my phone off the charger at 730am and coming home at 6PM which is nearly 13 hkurs, I still have up to 60% of a charge left. Even if I don't charge it at night when I wake up I have about 50% left. That is enough to make it through another day of work. When I get home on day 2, I gave roughly 10% left when I get in the car to go home. It takes me about 45mins to get home and yet my phone has never died on me in a day. Again in don't use my phone like you. On average I get less than 5 calls per day that last less than a couple minutes. The only people who have this number are family. They don't call me everyday. My work phone is an S6 Edge and I get all my work calls on it. It barely last 8 hours on an single charge. I use 2 phones because while I am on the phone, my Noten is in my hand writing things down, setting appointments and similar. I don't have my phone in my hand every minute on the clock. In fact I think if I totalled the actual time I see my Nite per day, it would total less than 4 hours. Just because it doesn't last 2 days for you, doesn't mean it doesn't for me. I have gone 2 full 24 hour days before I charged my Note based on how I use it. My S6 is my daily driver. It's handles all my calls and texts. My Note, maybe I text with it up to 10 times while at work mostly to my wife to make sure she is OK and my mom same reasons. I hate phone calls in general. I have people who answer my calls and I only get important ones. I have a desk phone. Also on my Note I ave turn off nearly every extra feature I don't use off. The only apps I have installed on it have to do with buying. AMAZON, ebay, banking apps and similar. The only game I play on it is bejeweled. I also have Excel and One Note and sketchbook. That's basically it plus the stock apps. I also have Gmail and my work mailbox as well, but I have all sync turned off. I love my edge model more which is why I do everything on it. The note is strictly business. Battery life is heavily dependent on usage. I don't care what additional functions phone has, I care for how long can i perform a certain action i want, before the battery runs down. Efficiency relates to performance per Watt of consumed power, not amount of bloatware. No iPhone ever came close to taking 4 hours to charge, unless hooked up to a low powered USB port, the combination of Apple iPhone AND Apple smart battery case, leads to ability of being able to soak up much more power in the same amount of time, in other words lasting much longer per, let's say a 10 minute charge. The case has it's own charging port. Two are better than one. Wow it is so innovative!!! That's fruity for us, a truly innovative company. All hail the fruit. Some of the reviews have stated it has those features, so they must have gotten press kits with the case to review. The Apple page doesn't talk about any of that. Lol what a load of bs!! Don't tell me it cure cancer as well? It doesn't have on/off switch, once you attach it, it immediately starts charging, and there is no way to pause it. A full charge of the cover will give you a 60% charge on the phone. It doesn't have "super" quick charging. And it offers more of a scratch protection than drop protection since it's made of soft rubber. When Apple's biggest fanboys in The Verge(yes you read it right) mocks this hideous case, and comes too close to call it useless, then there is no reason for any of you fanboys to defend it. And there I thought you pay premium for premium design, thinness and build quality, not the features. Especially not an extra premium to hide the design in a rubbery ugly case. I'm not a fan if Apple, but they nailed this design. All extended batteries should look like this. Not just one big rounded off back. Especially for removable battery replacements. Look at the HTC Thunderbolt extended battery. That's where this design comes from. And rightfully so. It aides I. Holding the device with a built in edge on the back. This alsobuses less materials over all as well. There are a lot of extended batteries made for phones, such as Galaxy S4, that make it a big brick, when it could have looked better with being flat a around, and only sticking out from the battery like this. It is ugly, but Lightning pass-through will be a big deal with this. You can charge it with the Apple 10w or 12w brick and it will charge the case and the phone at the same time. Still, it is fugly. I'm glad I have the 6S Plus and don't have to worry about battery life. Hahaha Apple isn't going to want you to charge it fast. I'm sure you'll be needed to use the 5w plug. It'll fully charge in 11 hours. It's apperently got the latest generation of Apple batteries... Considering it's bigger than the biggest battery in regularly sized iPhone, there is no reson to expect will will charge at just 5W. Well it also has an apple logo! I'm sure they became tired of selling hundreds of thousands f mophie cases in their store and not getting all of the profit. Going from an iPhone 5s design to an iPhone 6 design just showed they have lost their design chops. Then they made the iPad Pro which is a blown up iPad (nothing new there) with a pencil that has the worst functional design in any accessory product ever. They lost their design strength a while ago (unless they're doing it on purpose to save/make boat loads of money through exploitation in which case I applaud them for knowing their userbase). Written like a true fanboy. The iPad Pro has plenty different. As for the Pencil, the reviewers and professionals disagree with you and call it one of the best styluses on the market, ahead of anything Microsoft and Samsung offer. But hey, your narrative helps feed your cognitive dissonance, so good luck to you. WOW! 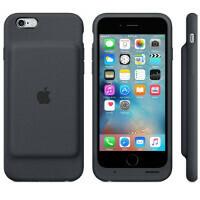 This is perhaps the ugliest battery case to date! Congrats Apple. I will buy 5 for my Galaxy S5. Ha ha. I don't need any extended battery my phone lasts me more than a day. I'm not a fan if Apple, but they nailed this design. All extended batteries should look like this. Not just one big rounded off back. Especially for removable battery replacements. Look at the HTC Thunderbolt extended battery. That's where this design comes from. And rightfully so. It aides I. Holding the device with a built in edge on the back. This alsobuses less materials over all as well. There are a litbof extended batteries made for phones, such as Galaxy S4, that make it a big brick, when it could have looked better with being flat, and only sticking out from the battery like this. I guess you and I have different opinions then. And reading up on this on different sites, most users think it's an ugly design (among them a lot of Apple fans). While most battery covers are ugly,this one tops most of them. And the HTC Thunderbolt extended battery is a lot prettier than this one. This is ugly... in my opinion. I would rather get an external battery and used when needed. Yes, it is the most ugly case ever.